Toofan Harirod F.C. won the Afghan Premier League’s (APL) championship for the second time after winning the final match against Shaheen Asmayee F.C. from Kabul. The only goal of the match was scored by Toofan’s Rauf Qaderi at 100th minute of the match. The two teams had many opportunities to score a goal but it was Toofan’s Rauf Qaderi who scored the only goal of the match. Toofan had many chances compared with Shaheen Asmayee during this match. The thrilling match was between Shaheen Asmayee, from the capital, Kabul, the four times title holder of APL, and Toofan Harirod, from the western zone, at the Afghanistan Football Federation stadium in Kabul. Toofan Harirod has won the APL cup when the league was first launched in 2012. By getting nine points after three consecutive wins against Simorgh Alborz, De Maiwand Atalan and De Spinghar Bazan in the group stage and defeating De Abasin Sape in the semi-finals, Toofan Harirod had an exhilarating journey to the final match in this season. Shaheen Asmayee, Toofan’s powerful rival in the final match, appeared as perfect in the APL 2018 as it has been since the past six years. Shaheen also escalated to semi-finals with no loss in the group stage and a total of nine points by wins against Mawjhai Amu, De Abasin Sape and De Spinghar Bazan. The team defeated its runner up rival of the past year in the semi-finals and advanced to the final. Shaheen Asmayee, De Maiwand Atalan, Toofan Harirod, Simorgh Alborz, Mawjhai Amu, De Spinghar Bazan, De Abasin Sape, and Oqaban Hindukosh are the eight APL teams representing all 34 provinces in Afghanistan. 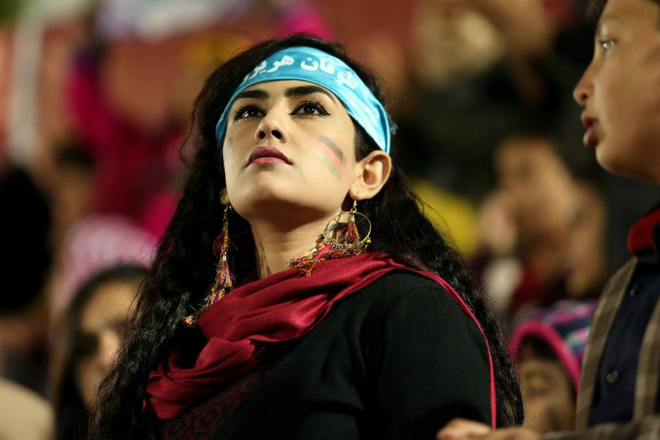 The 2018 season of the Afghan Premier League, centered around the message “One nation – One voice”, kicked off earlier this month after it was postponed due to insufficient financial support. The APL was launched six years ago and is held annually at regional and national levels. Eight zones are represented in the APL – which is staged over six months, starting with regional selection tournaments and then ending with eighteen national league matches in Kabul. A fan of Toofan Harirod F.C. in APL final match in Afghanistan Football Federation Stadium on October 25. The thrilling match was between Shaheen Asmayee, representing of the capital, the four times title holder of APL, and Toofan Harirod, from the western zone.